Discourses and Meditations from the Meditation Camp at Nargol, Gujarat, India; and Discourses given in Bombay, India. 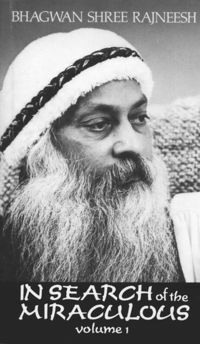 5 Discourses on Kundalini Energy and Dynamic Meditation, and 3 Meditations from the Meditation Camp at Nargol, Gujarat, India from May 2 - 5, 1970; and 4 Discourses on Kundalini Energy and Dynamic Meditation given in Bombay, India, June and July, 1970. Ch. 1 - 4 previously published as The Journey of the Kundalini. Ch. 1 - 2 and 4 - 12 previously published in The Mystic Experience Ch. 1 - 9. Later published as part of the single-volume In Search of the Miraculous. This page was last edited on 19 January 2019, at 06:44.